This custom administrative page provides a wizard to help you create customized Facebook code snippets that you can place on Donation Forms, Action Alerts, Surveys, and other Convio forms to allow users to easily share interactions on your site with their friends. To use this code, you will create a custom Admin page on your convio site, paste the code into it, and bookmark it for future reference. Use the custom admin page to generate Facebook code snippets, then copy and paste the generated code into your Convio forms. Create a new Single Component PageBuilder page called "fb_code_generator". On Step 1, item 5 "Page Type", select "Administrators". Proceed to "Add Content". Create an HTML Content area in the single page component. Turn off the WYSIWYG and paste in the attached code. 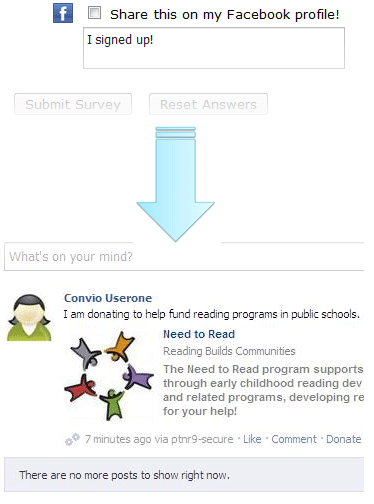 Follow the page instructions to generate code and paste it into your Convio forms.